Developing or streamlining an accommodations process to support applicants, new hires and existing employees can be difficult. It’s hard to know what you don’t know about accessibility, assistive technologies, and how to best process and implement an accommodation. Give all your key team members the information they need to make your accommodations process functional, efficient, compliant and inclusive for all. 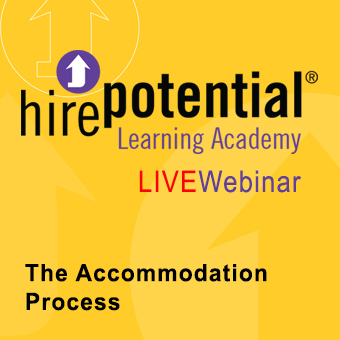 Created for all levels of management within your organization, this 90-minute webinar is interactive and provides a solid foundation for establishing an interactive accommodation plan as it relates to employing and retaining individuals with disabilities. You’ll learn more about: Office of Federal Contract Compliance Program, key regulations such as Section 503, EEO, ADAAA and Section 508, changes to the definition of disability, managing risk, resources to assist with the interactive process and more. Stop wasting time searching for the what and how of providing and implementing an accommodation. Everything you need to solve an accommodation quickly, reduce risk, increase productivity, minimize exposure and provide equal access for employees, customers and constituents is all right here. 1.5 Hour Session conducted via webinar. This introductory module is appropriate for use throughout the organization. The module is interactive and provides a solid foundation for efficiently accommodating your employees and limiting your company’s liability.